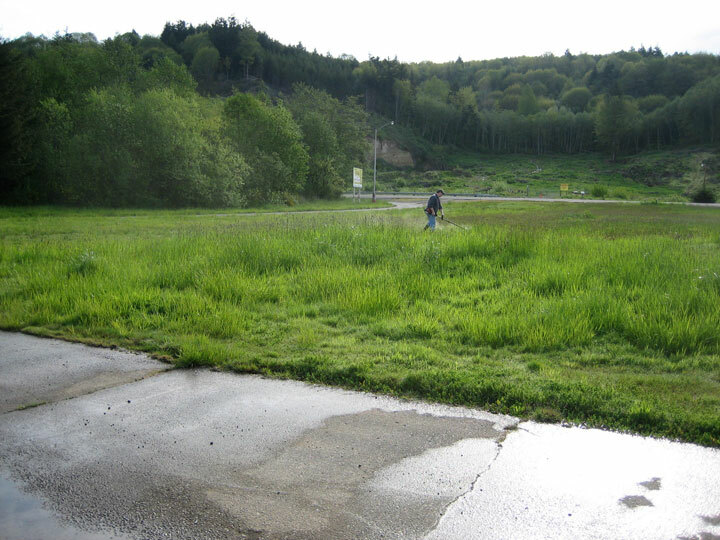 Rainy weather had kept the site owners from mowing the Combat area. Fliers had some work to do when they arrived. Buzz Wilson photo. May 5, 2012, Chehalis, Wash. The first C-Cup Combat contest was held under cloudy skies. What was forecast as sunny turned out to be off and on showers. The wet spring keep the site too wet for grass cutting. Scott had called the night before the contest and said the grass was tall and the site was wet. We know from the past couple of seasons that early on it is wet and bring hip boots. Robert Smith showed up in tennis shoes but did bring some rubber mats that made for a good bridge and pitting surface. Four flyers turned out for a fun day of combat. The Beavers* would have flourished on the site had they shown up; they would have created a Beaver pond in short order. The first event of the day was single elimination Half A. The first match was the best one. If featured Jeff Rein and Robert Smith. Robert got a cut on Jeff, and later in the match, a line tangle put Jeff into the ground. With less than a minute to go Jeff got back up and immediately went after Robert and got a kill. I flew Don McKay and there was a midair with Don winning the match. This left Robert and me flying for third and fourth with Robert securing third. Jeff and Don flew for first and second with Jeff beating Don. Roberta, Don's significant other, has adopted the combat flyers. This is good since she used to own a catering business. She prepared lunch that was enjoyed by all. Next up was F2D cuts only. Since we had four flyers, everyone would fly each other one time and then we would figure the results. First up were Don and Jeff. Don was using an OS Max 25 the rest of the flyers were using 15's. Don beat Jeff. I was up against Robert and had a screaming engine run on a Redko, as I walked to the handle the engine stopped suddenly. Robert won the match on a rear bearing failure. The second round had Jeff beating Robert, me beating Don. The third round Robert beat Don. In my match with Jeff, I got up first and then Jeff came into the circle. One lap and I heard the sound of a plane lawn darting into the soft ground. There had been a push rod malfunction and Jeff could not get back into the air. At the end of the three rounds, Robert and I each had two wins and one loss, but because I lost to Robert he got first, I got second. Jeff and Don tied with one win and two loses. Because Don beat Jeff he got third and Jeff fourth. Scott's sons, Daniel and Nathan did a great job on the stopwatches and counting cuts. After the contest, Robert gave them a F2D plane with an older 15 on it. He put Nathan up with it and he took to it like a duck to water, perhaps because he was standing in water, inside loop and his first outsides. He waded back to the pits with a big smile on his face. Chehalis Cup Contest No. 2 is scheduled for June 16 See Where the Action Is for details.